Zemic Europe: WEP-Weisshaupt and Zemic Europe have worked together to develop an overload detection system which could be integrated in their material lifts. Not only is the total weight measured in these lifts/baskets; also the weight in each of the 4 corners of this lift is measured and indicated on a display. WEP-Weisshaupt is a powerful engineering company that manufactures equipment for car control stations, vertical and horizontal transport systems, column lift systems, vehicle lifts, handling devices and special constructions. Their ambition is to find an individual solution for every customer request. Any product that leaves the company is a result of their own development, design and manufacturing. At Zemic Europe we strongly believe that our focus on creating value for our customers will help them to differentiate themselves in their market. Our slogan is "We believe we make you stronger!". To achieve this Zemic develops many customized solutions for their customers. WEP-Weisshaupt build different material lifts and they were looking for an overload-detection system to equip their multicolumn-lifts. Their multi-column lifts are either made with 2 or 4 columns, each column carries a part of the load and needs to be monitored. They wanted to integrate the overload detection without having to change too much to their existing design. So WEP-Weisshaupt searched for a partner who could help with the selection of the most appropriate sensor for this application. Zemic has a wide program of sensors and, with their large engineering department, the capacity to design custom made sensors. Zemic has designed a small load pin which fits exactly in the system. WEP-Weisshaupt wishes to develop a unique system for its customers, in which not only the total weight can be monitored, but also the weight in each of the 4 corners of the basket. Zemic combined the use of loadpins with a weight transmitter. On a LCD display the total weight and the weight for each corner can be shown. When the maximum weight, in total, or in a corner, is reached, the system indicates it. The advantage is that overload will be detected in an early stage which allows for damage control and cost savings. The VSL is a lift system with 4 columns on which a basket, a platform or an individual custom device (supporting frame, lifter) lifts up. The columns are arranged in pairs opposite to each other, on the short or the long sides of the basket, because no drive sections pass through the platform. The possibilities are endless. The VSL has a net load of up to 3000 kg and can be designed for lifts with heights from 3 m up to 12 m.
A wide range of lifting devices with a variable width and length of the platform is possible. Only the static sets a limit at the end. Platform lifts, fixture constructions as well as many more options are possible. An integration of the lift into production processes is also possible. The systems are always designed with close consultation between the customer and the technicians of WEP-Weisshaupt. In the column lift system, both load pins and weight transmitters are used. Loadpins are force sensors which are being installed in applications for measuring dynamic, static or hoisting forces. For example the use of loadpins for the overload protection of cranes, creating load measuring systems, building load limitation systems and to optimize the service life of hoists. Loadpins are often used when load cells do not fit in a system, because they are available in very small sizes. Zemic has often experienced customer specific requirements for a loadpin, concerning the dimensions, IP grades, integrated transmitters, specific cable exits, redundant solutions etc. For this reason Zemic has designed a special webpage ‘Design your loadpin’, so each customer can enter the required specifications. 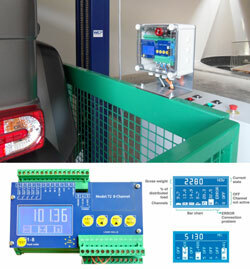 Weight transmitters are used in production areas which can be found mainly in the process industry. These weight devices with indication display are connected with PLC's, other transmitters or indicators. The Top-Sensors weight transmitters offered by Zemic Europe are suitable to connect directly 1, 4 or even 8 loadcells directly to the device. Weight transmitters convert the weight signal (in general 2 or 3 mV/V at full scale) into a 4-20mA output, 0-10V output, 0-5V output or communicate by fieldbusses like Profinet, Profibus, CanOpen, Devicenet, Ethernet etc. For this application the T2 Weight Transmitter 8-Channel is designed. The unique feature is the individual setpoints for each channel.